Holly Leaf Sweetspire is a gem of an evergreen in our climate. Holly like glossy round leaves are a wonderful backdrop to the 14″ long green chains that hold tiny flowers from July to September. Flowers are sweetly fragrant in close proximity. 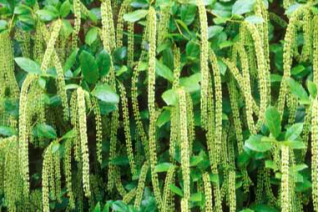 Large growing spectacular shrub to 9′ tall and 6′ wide moderately fast. Full sun to quite a bit of shade. Average to rich soil with regular summer water. Established plants can make due with less. A natural for an espalier. Remains in bloom for two months. Handsome shrub. SW China.